Fish & Cheeps is a duel minigame in Mario Party 7. Its name is a pun on the meal fish and chips. 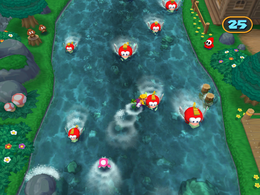 The player and a rival have to swim in a river full of Cheep-Cheeps, avoiding them as they move onward. After a short time span, some Cheep-Cheeps start to go in zigzags and even chase the player if he or she gets too close. The game ends once someone bumps into a Cheep-Cheep. If there is no winner after thirty seconds, it will end in a tie. It is somewhat similar to Bridge Work. Rules – "Swim and dodge the school of angry Cheep Cheeps. If you touch one, it's game over!" Advice – "Watch for vengeful Cheep Cheeps! Some of them will chase you!" This page was last edited on August 8, 2017, at 12:21.